On Thursday, February 7, I had to let my sweet cat Disney go to be with Ben and my dad. She was a brave and strong little girl. 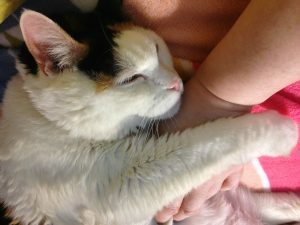 At 17 years old, she had so much wrong with her- thyroid, diabetes, severe arthritis and cancer, and so many daily medications/injections/infusions, but she fought and stayed so loving and cuddly. On that evening, she kept falling over and then standing still, frozen and clearly scared, and she was also severely congested. She was miserable. I called the vet in a panic and they told us to come in. 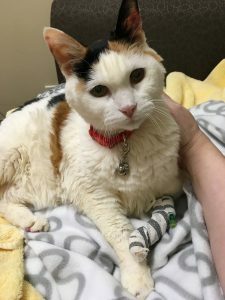 Turned out that she had a respiratory infection, and I could have left her overnight for an infusion of IV antibiotics to treat the infection, but her legs were not going to get better. 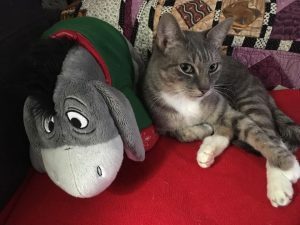 The vet said that given how Disney had been progressing, it was likely that within a couple of weeks, she would have been back at the vet with another problem. And, her legs would only continue to weaken. I didn’t want her to live like that. I always promised myself and her that I would never be selfish and keep her here because I could not stand to lose her. During this time of her decline, I was living much the way I did when Ben was alone at home while I was at work. I worried throughout the day if she had fallen or if she became immobile or worse. I ran home after school and was grateful to find her up on the sofa waiting for me. Here I was, having conversations with the vet like I had in the hospital with Ben’s doctor. After Ben had his tracheostomy and got the feeding tube, he had several infections and pneumonia. This indicated that if Ben had chosen to go to a facility, he probably would have returned to the hospital within a couple of weeks with another similar infection or pneumonia. Ben had to decide how he wanted to live and die with ALS. Ultimately, he chose to go to the hospital’s hospice unit and separate from the vent. He knew that I would have supported any decision he made. In Disney’s case, I had to decide what was best for her. I didn’t want her to be miserable. I let her go. 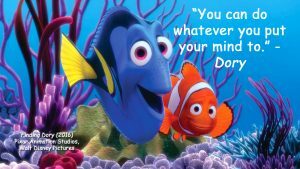 Disney was there for me in the worst days with my dad and Ben. She was there for Ben, even at the end when they let her visit him in the hospice unit. 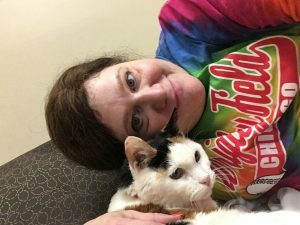 I tried very hard to keep her as comfortable as possible, and on that Thursday night, I was there for her, holding and talking to her as she very peacefully left this world. I’ve done this too often for my loved ones in recent years, and although it’s an honor filled with love, I’m overwhelmingly sad and reliving all of those bad moments. I can now add the loss of Disney to the other lousy February dates: my dad’s birthday, I lost my dad and my grandma in February, and it was Ben’s birthday. I’m always happy to welcome March. I know all the feelings of grief and their unpredictability. I know the sadness and the loneliness and even the anger, though that has been a more recent emotion for me within the past year. I am now caught up in the bad memories of conversations that I had about Ben, being there and watching him leave this world, feeling the awful loneliness at home, losing my routine. Disney was on special foods and meds that made for long mornings before I left for work. My mornings with Ben were also hectic, making sure he was settled and secure before I left for school and rushing to get out the door. Those memories have not been not the ones that stick out at this point. I prefer to focus on the good times. But they’re back and they’re gnawing at me. The frequent tears have returned. I had taken Disney’s Valentine picture the weekend before she died. I’ve written about my Valentine card-making tradition. Here I was with a bunch of Valentine cards featuring Disney’s photograph. Should I send them? Would people think it was wrong? I decided to send the card with a note attached that said that I kind of knew that it would be our last Valentine card, and that I wanted people to have a sweet memory of Disney because, after all, Valentine’s Day is about love. I am someone who has to have a furbaby, and although it was very soon, on February 18, I welcomed a new little love, Tinker Bell, or Little Bell, as I have taken to calling her because, at less than 8 pounds she is almost fairy sized! She is only two years old and had a rough start in life, but she is a friendly, adorable cat who almost immediately began following me everywhere and talking to me. She is always at my side but she does not like to be hugged or held, as Disney did. Tinker Bell has quickly learned that in this home, she is safe and loved and will be spoiled. Sometimes, she is a delightful distraction because she is a bundle of energy that runs around the apartment and is so curious. At other times, because we don’t yet know each other well, I am reminded about the many things I loved and now miss about Disney. It unnerves me to wake up and not have to make time to give medication and arrange special meals because I feel the loss (but am so grateful that Tinker Bell is healthy.) Changes in routine are reminders of the loss. Disney knew everything I went through with my dad and Ben and was always ready for a cuddle when I needed it. Sometimes I think about that and smile and sometimes I cry. I tell Tinker Bell about Disney and I like to think she listens so that she knows that she, too, will be adored (and that hugs are nice!) I like to think that Disney is also listening when I talk about, and to, her so that she knows that she will always have a big place in my heart. 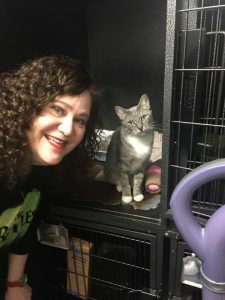 Although she was given a birthday of January 29 because it was the day that she was found in a box on Staten Island, I gave her a birthday of February 18, so give myself one good day in the month of February. With a name like Tinker Bell, I believe that she is going to be the pixie dust that the month of February needs. Tinker Bell is settling into her new Disney lifestyle! I haven’t written about the new film Mary Poppins Returns. It is a very special film. The original Mary Poppins is very dear to me because it was the very first film I ever saw in a theater, and because for me, it is pure magic. Julie Andrews will always be Mary Poppins to me, though Emily Blunt did a wonderful job. This new version does not quite have the same whimsical magic for me, but it is very touching, and special in its own right, with important messages that resonated with me about love and loss. The song Where the Lost Things Go addresses how those we love and lose stay with us.So much of what defines our relationships seems to vanish with those we lose, but the memories keep them alive, but in a different way. It is not enough, and yet, it is quite a lot to have felt and given love, and to believe that our loved ones are thriving in a different place while they live in our hearts. I’ve printed the lyrics along with a video of the song. There are things that I miss about all of the too many people and pets I have lost, and yet, they are not really lost because they reside within me. The fact is that all of the love I have felt and given has helped to shape me. Now, I hope that Disney and Ben are “where the lost things go,” comfortably walking together, and I’m sure my dad is spoiling her as he always did. Brave Disney during her hospital stay. I have written before that although I lost myself when I was caregiving, I also found myself in caregiving. I might have fought it when things were difficult or devastating, but I also learned to embrace the beauty of caregiving and to recognize the strength that I do possess when I am in the role of caregiver. I have lost my dad and Ben, but my role continues and it is a perfectly imperfect fit. That became especially clear to me over the past few days, while caring for my ailing cat, Disney. 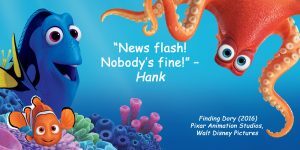 Disney was originally diagnosed with a thyroid problem and diabetes just two weeks after Ben passed away, and the news sent me reeling but I was not going to let the undertow drown me. I was told that I would manage her condition by administering injections of insulin twice a day. I am a squeamish person and this had me terribly nervous. But, I reminded myself of all the very ugly and messy things I had to do for my dad and for Ben. “You are braver than you believe, stronger than you seem, and smarter than you think.” Yes, and thank you, Christopher Robin, I am. Disney is a wonderful patient, and she makes things pretty easy. She has begun to eat the pill pocket containing her thyroid medication, leaving the pill visibly displayed for me, showing that I have not outsmarted her. But, as her caregiver, I have to ensure that she gets what she needs. A couple of days ago I took Disney to the veterinarian for a follow-up visit, pointing out that she was not eating as well as usual. The vet suspected some kidney damage and an infection. Her blood sugar was also very low. She stayed in the hospital overnight for glucose infusions and monitoring. Then, it was determined that she should have an ultrasound. I was able to visit her during her two night stay, and when I was with her she curled up against me and closed her eyes, because all is well in Disney’s world when her mommy is with her. I love the quiet, sweet moments when I know that I am comforting her. When we got home and before we went to sleep she was not acting right. She had two accidents on the bed, which I attributed to the infection. But, she was extremely lethargic and wobbly. Then, she had what turned out to be a seizure. I held her in my arms and she calmed down. After another similar episode, I decided that I had to call the Emergency Room at around 4:30AM. The doctor asked several questions and heard Disney’s distress meow, and said that I should get her to the ER. I sat and waited for a report, as I had done so many times with my dad and Ben. I felt that same exhaustion and worry. And, I realized that although I was distraught, I only wanted to care for and console this little girl whom I love so much. I am most comfortable in the role of caregiver. It is who I am. It turned out that Disney’s blood sugar was super low, and had I not taken her to the ER, she might even have died. I am still having trouble wrapping my head around that. She was kept in the hospital for several hours for monitoring while they intravenously administered dextrose. She perked up and was doing much better, so I was allowed to bring her home. We are adjusting her insulin dosages but I must carefully watch her behavior and reactions. As I cancelled my weekend plans with friends to be with her, I had flashbacks of the many plans I had to cancel or postpone due to issues with my dad and Ben. Of course, there were times I was very disappointed about not going out, but caregiving was my priority and, at the time, because of so many conflicting emotions and so much chaos, I don’t think I even realized that I took pride in being the person they trusted and on whom they depended. It is only in retrospect that I began to realize that it was through caregiving that I really knew who I was and what I was meant to do. 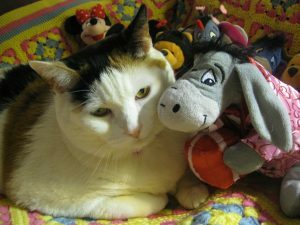 Now, I know that Disney will feel better if I am home with her and I love that I make her feel better and that I will be able to give the vet necessary information to inform the treatment plan as we move forward. I was afraid to go to sleep last night for fear that something would happen. Eventually, we both fell asleep. I awoke to her on the bed staring at me. She did not want to eat much of her breakfast, which has me concerned, but I will be in touch with her veterinarian. She definitely was not thrilled with all of the medications, but was very cooperative. She has been very cuddly and purring a lot, which is a good sign. As I’m writing this I am smiling, because although this is stressful, it is the normal with which I am most comfortable. This is who I am. And, for the first time, I’m feeling proud of it. 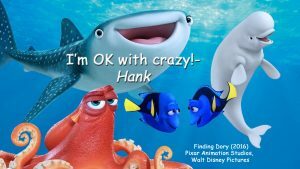 Like Hank, I’m OK with crazy! 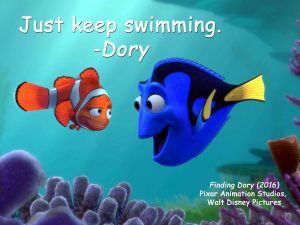 I admit that I am terrified of losing Disney. 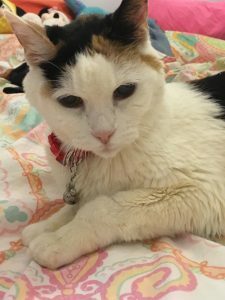 Intellectually, I know that she has health concerns, and that she is a senior cat. Emotionally, she is just such a lovely cat and she has been there for me as I cared for and lost my dad and then Ben. At my loneliest, most frightened and most inconsolable, she was there with cuddles. She is the cuddliest cat I’ve ever met. People who don’t love animals don’t understand. People like me, who love our pets, don’t understand people who don’t understand the love we feel for our furbabies. But, I was raised in a family that unquestionably valued our dogs as family members. My dad loved my cats, too, though he did unabashedly compare them to our Schnauzers! Some people might take offense at my comparing caregiving for Disney to that of my dad and Ben. I can tell you that my dad would have had it no other way and he would be flattered. Ben would completely understand and he, too, would be flattered. The bond that is felt when caring for someone you love, human or otherwise, is profound and priceless, despite the difficulties. I summoned the courage to ask the vet if she felt that I should brace myself for losing Disney soon. Thankfully, she said that we do not yet have to make that decision. But, she said that with all of Disney’s health issues, it is a challenge to manage all of her conditions. It is a lot of medication, additional vet visits and always the risk of ER visits. This is a big financial and emotional expense and challenge. In my mind, if she has a good quality of life and just needs management of her conditions, I am up for the task. 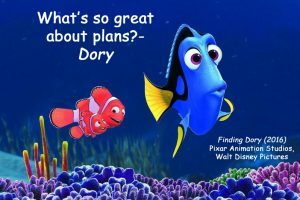 Disney has always risen to the occasion of comforting me and giving me joy and laughter. She did that for Ben, too. She was definitely affected by the way he changed as a result of ALS and in her own way, she was protective of him. 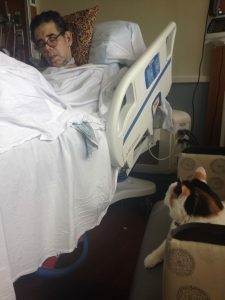 When he was in the hospice in his last days, I was allowed to bring her to visit him. At first, she didn’t like being on the bed with him because her arthritis renders her uncomfortable at times. She sat on the chair next to him and intently watched him. At one point he asked me to lift her and put his hand on her. When I put her on my lap to bring her closer, she pulled herself onto the bed and curled up on him. I put his hands on her and she turned on her side. They both closed their eyes. I believe that in that moment they said their good-byes. It was beautiful. For me, Disney represents a very close remaining connection to Ben. I’m sharing a photo of them in the hospice. I generally don’t share these personal photos, because they are difficult memories and private, but I do think that it is important for people to see the realities of disease. I will never be selfish and prioritize my desire to keep Disney with me over her quality of life. But, once again, I am lovingly, proudly and purposefully, though sadly, in the position of caregiver, and I will do whatever I can to give her a good quality of life and a lot of love, as she did for my dad, Ben and me. Disney thanks everyone for their well wishes while she recuperates.